Please fill out this form and we will get back to you shortly. Or give us a call us at the number listed above. For multiday trips, a 50% deposit is required to secure your booking. 50% deposit becomes non-refundable 4 weeks prior to trip. Full payment or deposit is refundable up to four weeks prior to trip minus a 10% processing fee. Balance due at start of trip. 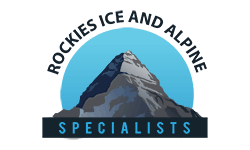 Cancellation by Rockies Ice and Alpine Specialists results in a full refund. We operate in all sorts of weather and mountain conditions. Instructional trips run regardless of the weather and we have areas where we can operate if weather is foul. Private guiding trips will depend on the circumstances, but be prepared to modify trip plans.